The Jordan Movie Blog: Who you Gonna Call? Ghostbusters 1 and 2 make my list of the top 100 movies of all time. When hearing this, most people exclaim "Ghostbusters TWO!?!?" in bewilderment. Yeah you heard me right, I actually enjoy Ghostbusters 2 MORE than the original. This can be attributed to the Summer of 1990 when HBO played the film non-stop for weeks at a time. My brother and I were at home a lot and just sat in front of the tube watching it over and over again. We learned all the lines nearly verbatim (Viggy Viggy Viggy, you've been a very bad MONKEY!) and can still go pretty much word-for-word when viewing the movie to this day. Apparently the proton packs may need to be dusted off as the much rumored-about Ghostbusters 3 is potentially moving towards a filming date of later this fall. To my personal delight it's rumored that the original cast members may be back to reprise their roles (lord knows Ernie Hudson can use some work). Making this news even better is the fact that the writers of The Office are working on penning the script. Combine the quirky Office-style humor with the original Ghostbusters and you've got movie gold as far as I'm concerned. 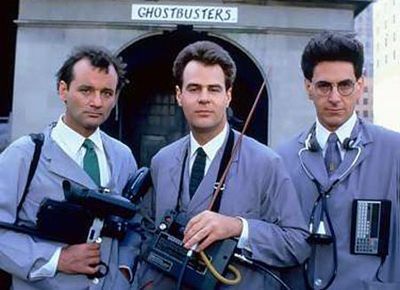 No matter how old Bill Murray, Dan Aykroyd and company are, Ghostbusters 3 would have to be better than Indiana Jones 4. Right? Um, Ray, could you please move? We'd like to shoot the monster! "Bassmasters. It's a fishing show. Yeah.... I know Bassmasters"